PCOS is a condition that causes irregular menstrual periods. This is due to the fact that monthly ovulation is not occurring and levels of androgens (male hormones) are elevated. PCOS is a condition that causes irregular menstrual periods. This is due to the fact that monthly ovulation is not occurring and levels of androgens (male hormones) in women are elevated. The condition occurs in approximately 5 to 10 percent of women. The elevated androgen levels can sometimes cause excessive facial hair growth, acne, and/or male-pattern scalp hair thinning. These symptoms are collectively referred to as hyperandrogenism. Most, but not all, women with PCOS are overweight and they are at higher-than-average risk of developing diabetes and obstructive sleep apnoea. For women with PCOS who want to become pregnant, fertility pills or injections may be needed to help women ovulate. Although PCOS is not completely reversible, there are a number of treatments that can reduce or minimise bothersome symptoms. Most women with PCOS are able to lead a normal life without significant complications. The cause of PCOS is not completely understood. It is believed that abnormal levels of the pituitary hormone, luteinising hormone (LH), and high levels of male hormones (androgens) interfere with normal function of the ovaries. To explain how these hormones cause symptoms, it is helpful to understand the normal menstrual cycle. Normal menstrual cycle — The brain (including the pituitary gland), ovaries, and uterus normally follow a sequence of events once per month; this sequence helps to prepare the body for pregnancy. Two hormones, follicle-stimulating hormone (FSH) and LH, are made by the pituitary gland. Two other hormones, progesterone and oestrogen, are made by the ovaries. 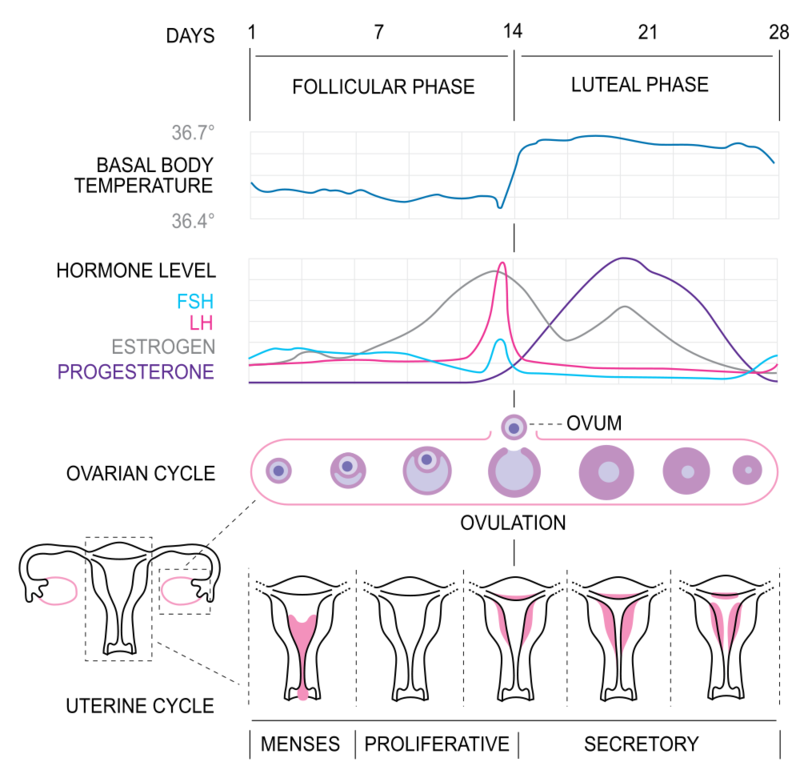 During the first half of the cycle, small increases in FSH stimulate the ovary to develop a follicle that contains an egg (oocyte). The follicle produces rising levels of oestrogen, which cause the lining of the uterus to thicken and the pituitary to release a very large amount of LH. This midcycle “surge” of LH causes the egg to be released from the ovary (called ovulation). If the egg is fertilised by a sperm, it develops into an embryo, which travels through the fallopian tube to the uterus. After ovulation, the ovary produces both oestrogen and progesterone, which prepare the uterus for possible embryo implantation and pregnancy. 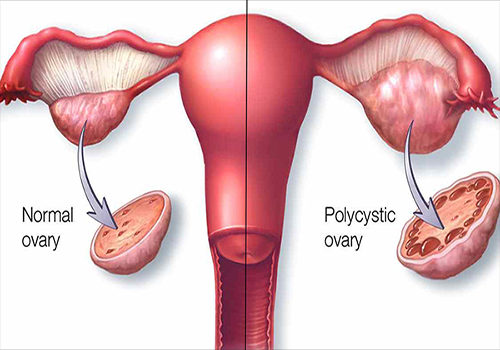 Menstrual cycle in PCOS — In women with PCOS, multiple small follicles (small cysts 4 to 9 mm in diameter) accumulate in the ovary, hence the term polycystic ovaries. None of these small follicles are capable of growing to a size that would trigger ovulation. As a result, the levels of oestrogen, progesterone, LH, and FSH become imbalanced. Androgens are normally produced by the ovaries and the adrenal glands. Examples of androgens include testosterone, androstenedione, dehydroepiandrosterone (DHEA), and DHEA sulphate (DHEAS). Androgens may become increased in women with PCOS because of the high levels of LH but also because of high levels of insulin that are usually seen with PCOS. Signs and symptoms of PCOS usually begin around the time of puberty, although some women do not develop symptoms until late adolescence or even into early adulthood. Because hormonal changes vary from one woman to another, patients with PCOS may have acne, facial hair growth or scalp hair loss of varying severity. Menstrual irregularity — If ovulation does not occur, the lining of the uterus (called the endometrium) does not uniformly shed and regrow as in a normal menstrual cycle. Instead, the endometrium becomes thicker and may shed irregularly, which can result in heavy and/or prolonged bleeding. Irregular or absent menstrual periods can increase a woman’s risk of endometrial overgrowth (called endometrial hyperplasia) or even endometrial cancer. Weight gain and obesity — PCOS is associated with gradual weight gain and obesity in approximately one-half of women. For some women with PCOS, obesity develops at the time of puberty. Hair growth and acne — Male-pattern hair growth (hirsutism) may be seen on the upper lip, chin, neck, sideburn area, chest, upper or lower abdomen, upper arm, and inner thigh. Acne is a skin condition that causes oily skin and blockages in hair follicles. Insulin abnormalities — PCOS is associated with insulin resistance and elevated levels of insulin in the blood. Insulin resistance and raised blood insulin levels can occur in both normal-weight and overweight women with PCOS. Among women with PCOS, up to 35 percent of those who are obese develop impaired glucose tolerance (“prediabetes”) by age 40 years, while up to 10 percent of obese women develop type 2 diabetes. The risk of these conditions is much higher in women with PCOS compared with women without PCOS. Infertility — Many women with PCOS do not ovulate regularly, and it may take these women longer to become pregnant. Heart disease — Women who are obese and who also have insulin resistance or diabetes might have an increased risk of coronary artery disease, the narrowing of the arteries that supply blood to the heart. It is not known for sure if women with PCOS are at increased risk for this condition. In addition, there must be no other cause of elevated androgen levels or irregular periods (e.g. congenital adrenal hyperplasia, androgen-secreting tumours, or hyperprolactinemia). Blood tests are usually recommended to determine whether another condition is the cause of your signs and/or symptoms. Blood tests for pregnancy, prolactin level, thyroid-stimulating hormone (TSH), and follicle-stimulating hormone (FSH) may be recommended. Insulin levels are not used to diagnose PCOS, partly because insulin levels are high in people who are above normal body weight and because there is no level of insulin that is “diagnostic” for PCOS. If PCOS is confirmed, blood glucose and cholesterol testing are usually performed. Many clinicians who treat PCOS patients also recommend screening for sleep apnoea with questionnaires or overnight sleep studies in a sleep laboratory. In women with moderate to severe hirsutism (excess hair growth), blood tests for testosterone and dehydroepiandrosterone sulphate (DHEAS) may be recommended. All women who are diagnosed with PCOS should be monitored by a health care provider over time. Symptoms of PCOS may seem minor and annoying, and treatment may seem unnecessary. However, untreated PCOS can increase a woman’s risk of other health problems over time. Note: The treatment options below help manage and improve symptoms but are not in themselves ‘cures’ for PCOS. Oral contraceptives — Combined oral contraceptive pills are the most commonly used treatment for regulating menstrual periods in women with PCOS. They protect the woman from excessive thickening of the lining of the uterus or cancer by inducing a monthly menstrual period. In addition they are effective for treating hirsutism and acne. Some women choose intrauterine devices containing a type of progesterone (e.g. Mirena IUS) to minimise uterine bleeding and protect against uterine cancer. However, unlike the combined oral contraceptive, these are not effective for treating acne or facial hair. Other prescription skin treatments (e.g. medicated lotions) or oral antibiotics may be recommended in some cases to treat acne. Hair treatments — Excess hair growth on the face and/or other parts of the body can be removed by shaving or use of depilatories, electrolysis, or laser therapy. Many women worry that these treatments cause hair to grow faster, although this is not true. Weight loss — Weight loss is one of the most effective approaches for managing insulin abnormalities, irregular menstrual periods, and other symptoms of PCOS. For example, many overweight women with PCOS who lose 5 to 10 percent of their body weight notice that their periods become more regular. Weight loss can often be achieved with a program of diet and exercise. Metformin — This is a medication that improves the effectiveness of insulin produced by the body. It was developed as a treatment for type 2 diabetes but may be recommended for women with PCOS in selected situations. Metformin is not usually recommended for women with PCOS who have difficulty becoming pregnant, because it is not as effective as an alternative treatment for ovulation induction, Clomiphene. An expert group does not recommend metformin for women with PCOS who have excessive hair growth (hirsutism). Treatment of infertility — If tests determine that lack of ovulation is the cause of infertility, several treatment options are available. These treatments work best in women who are not overweight.